Russian is often missed on Top-10 lists of mostly-spoken languages worldwide and, therefore, we are offering you a unique opportunity to learn a new language and to acquaint yourself with the gorgeous Slavic culture. What better place to do so than in the city where both Western and Eastern Russian cultures meet – Kiev, Ukraine? Once you have witnessed Eastern-European culture and all the hidden architectural pearls which the former Eastern Bloc has to offer, you will fall in love automatically! 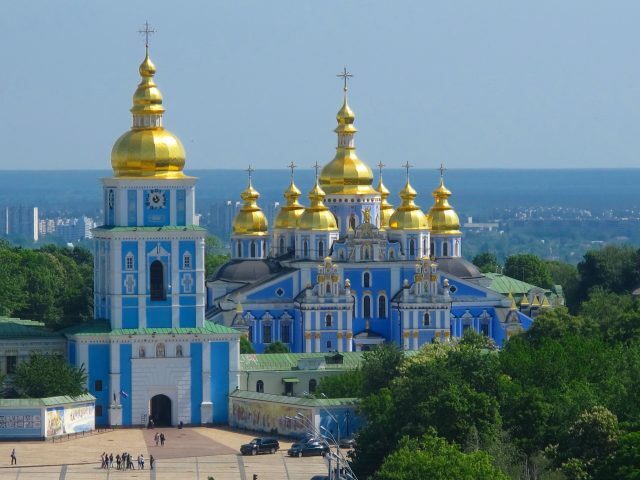 One of those pearls that is largely untouched by mass tourism is Kiev, which is rightly considered one of the most beautiful cities of Eastern Europe! The Ukrainian region of Kiev was already inhabited in 5.000 BC, and the centuries that followed were generally calm, with different peoples settling in and leaving the area. That is, until 482 AC, when – according to Tale of Bygone Years (a.k.a. the Primary Chronicle) – the city of Kiev was founded by Kyi, Khoryv and Shchek, three brothers and the leaders of the Polianian tribe. The city was named after Kyi (Kyiv), and the two hills of the city after the other brothers (Shchekavytsia and Khorevytsia). The tributary of the Dnieper was named after the brothers’ younger sister, Lybid. The city expanded its territory into a large empire – Kievan Rus – which, during its heyday in the 11th century, stretched from the west of Finland to the south of Hungary. After being occupied by the Mongols (Golden Horde), the Lithuanians, and the Poles, the region was eventually conquered by the Russians in 1667. Under Russian Empire, Ukraine was an autonomous entity. This allowed Kiev to flourish and become not only the third most important city of the Russian Empire but also the most important trading centre of the southwest during and after the Industrial Revolution. As part of the Soviet Union, everything was decided from and through Moscow, and Kiev had little to say. Nevertheless, the city gradually changed over time from a Russian-speaking city to a more Ukrainian city. 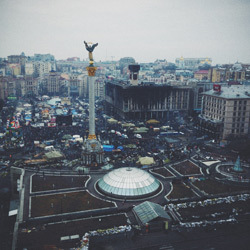 After the fall of the Soviet Union, Kiev further developed into the economic and cultural centre of the region, and became an important city for political gatherings such as the Euromaidan. In Western Europe we are spoilt by cities such as London, Paris, and Amsterdam. In Eastern Europe there are generally fewer such pearls to be found, but there are still plenty of cities that will allow you to see the true spirit of the region. Maidan Nezalezhnosti Square, also known as Independence Square, is known as a meeting place for political affairs and demonstrations, with the 2014 Euromaidan being the most recent. The square and its surroundings are built in a Stalinist style and contain many references to the Soviet period. Walk from Maidan Square to Vladimir Hill (Volodymyrska gorka) to admire the St. Michael’s Monastery, a beautiful orthodox church with blue walls and golden domes. 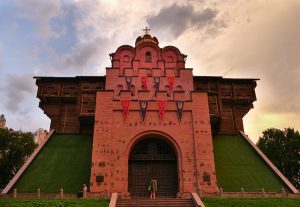 It was built in the 12th century and appears in the Primary Chronicles of Kiev, in which both the establishment of Kiev and the Kievan Rus are described. The hill on which the monastery was built is a former citadel, built by and named after Iziaslav I of Kiev, Grand Duke of the Kiev Empire. Nearby is the Ukrainian National Museum of History via the Andriyivsky hill – also known as “Andreevsky Spusk” – a 700-metre paved road that crosses the old part of Kiev. The museum hosts various exhibitions throughout the year, including ethnographic material and archaeological finds, as well as an important collection of Scythian art. After your visit to the museum – or if you do not like museums – it is best to continue towards the Golden Gate (Zoloti vorota), the medieval main gate of the city named after the Golden Gate of Constantinople. The gate was dismantled during the Middle Ages, leaving few parts of the original entrance standing. It was completely rebuilt by the Soviets in 1982, but no images of the original have survived. During the walk to the Golden Gate you will pass the most famous cathedral in the city, the St. Sophia Cathedral, well-known for its golden domes and impressive appearance. The church owes its name to the Hagia Sophia in Istanbul and has a turbulent history, having survived several attempts at demolition by the anti-religious Bolsheviks. After protests from noted historians, the church was taken over by the Ukrainian government and transformed into a museum of architecture and history. In addition to the highlights listed above, there are plenty of other things to do in Kiev. Shopaholics are provided for at Khreschatyk Street, the most famous shopping street of Kiev, where you can find cheap clothes alongside refined porcelain and the most expensive watches. If you are keen on more upscale brands, it’s best to go to one of the major shopping centres in the city, such as the Gulliver Shopping Mall or the Ocean Shopping Mall. If you’re looking for trinkets you should go to the Andrivsky Uzviz, where you will find handmade artistic products amongst the regularly-offered souvenirs. Art lovers will enjoy the Pinchuk Art Centre, the Mystetskyi Arsenal – with its displays of contemporary art – or the National Museum of Russian Art, which houses the largest collection of Russian art in Ukraine. If you prefer more classical art styles and general history, you should visit the National Art Museum of Ukraine, which exhibits the masterpieces of Ukrainian painting and sculpture from the Kievan Rus all the way to modern times. 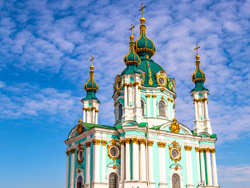 Our Russian language school in Kiev is located in the historic centre, just a short walk from the stunning St. Sofia Cathedral and the remains of the ancient city gate. Housed in two historic buildings that have recently been renovated, on a street lined with beautiful 19th century architecture, our school offers fantastic facilities for students. These include a library, language laboratory, movie theatre, and conference room, as well as fully-equipped classrooms, a snack bar, and air-conditioning and free wireless internet throughout. Walk through the many city parks, such as the Hidropark, where you can find a miniature version of the city. 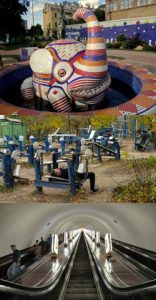 If you prefer not to spend money on the Street Art Tour, go to Pejzazna Alley, where you will find various absurd sculptures designed by artists such as Avraam Miletsky. Travel via the deepest underground station in the world, the Arsenalna Metro Station, and visit the Rodina Mat, a statue that is 102 meters tall!